Which Crate Companies to Choose When Shipping Art? Everyone knows that proper packing is crucial when it comes to shipping fine art and antiques. That’s true. However, let’s not forget that even high-quality soft packing is sometimes not enough to protect the artwork in transit, especially if you are shipping it overseas. The truth is that the only right way to ensure that the piece arrives at the destination in its perfect condition is to put it inside a custom built wooden crate. This is where professional crate companies come into play! As the name suggests, Fine Art Shippers is a fine art shipping company specializing in handling, moving, and shipping art, antiques, and other valuables. 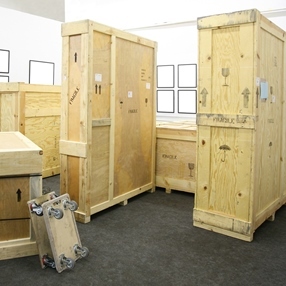 However, we are also one of the best crate companies in the New York metropolitan area, which allows us to offer comprehensive art packing and crating services in-house. Besides, our friendly and knowledgeable staff always makes every effort to provide our clients with the exceptional service they deserve. As a result, many contemporary artists, art galleries, antique dealers, auction houses, and private collectors choose Fine Art Shippers to pack, crate, and ship their precious art pieces, and we are very proud of that! It is also worth noting that not all art shipping companies offer professional art crating services. Many of them outsource this crucial step of the packing process to third parties. That’s not bad, but when art shipping companies hire independent crate companies for this job, the cost of the service usually increases dramatically. For this reason, if you want to save some money, you need to choose a company able to provide you with all the necessary services without outsourcing any of them to crate companies or any other parties. As it has been already said, Fine Art Shippers is just the right choice that will help you stay within your budget without sacrificing the quality of art packing and crating services. Moreover, if you request a free shipping quote, you will find out that our rates are very competitive, which is another good reason to hire our team for transporting art, antiques, and other valuables. Finally, it should be noted that while we pack and crate most of the artworks in our warehouses, we can also do it on-site. Just let us know about your requirements, and we will take care of the rest!